Nesox Email Marketer Business Edition 2.01 - Download Win Apps. Bulk email software, newsletter software and opt-in email marketing software. 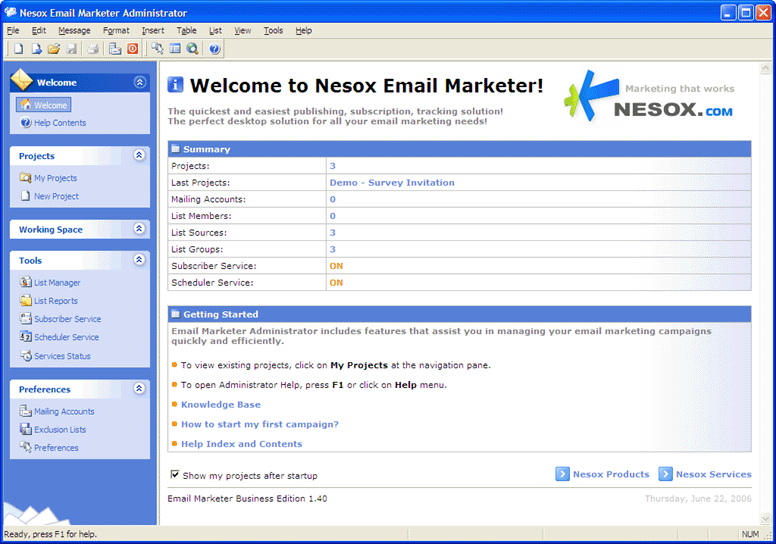 Nesox Email Marketer is a professional bulk email software, email newsletter software and bulk email marketing software that helps you build opt-in mailing lists, manage email newsletter marketing campaigns, create personalized email newsletter with 200+ built-in templates, send bulk HTML emails campaigns in minutes and track email open rates and click rates. Business slowing down because of recession? Use follow-up autoresponder marketing and newsletters to get value from your customer relationships. FollowUpExpert is an easy-to-use program gives you complete control over your mailing lists.